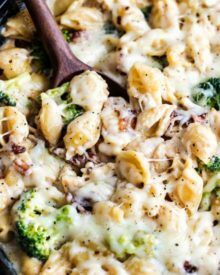 This ultra creamy chicken casserole is made with cheese sauce, pasta, chicken, broccoli and bacon. 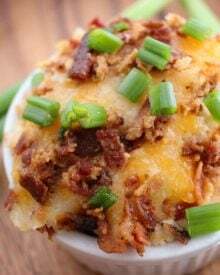 Kid-friendly and perfect for a weeknight meal! A chicken casserole your family will be happy to have for dinner! You guys, I thought a LONG time about what to call this recipe. It’s sort of a casserole; and sort of a mac and cheese. 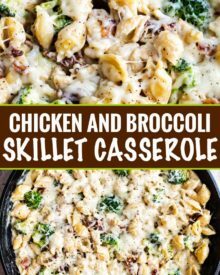 In the end I went with casserole, but seriously, you can call it whatever you want… because once you make this, your family will be requesting “that really good meal with chicken pasta and broccoli”, like my family does! 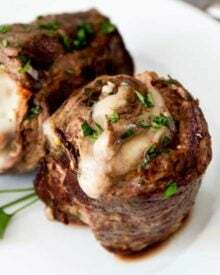 I love love love making this meal because it’s easy to prep ahead, easy for a busy weeknight, and reheats really well. IS THIS CHICKEN CASSEROLE A ONE POT MEAL? Technically, no. 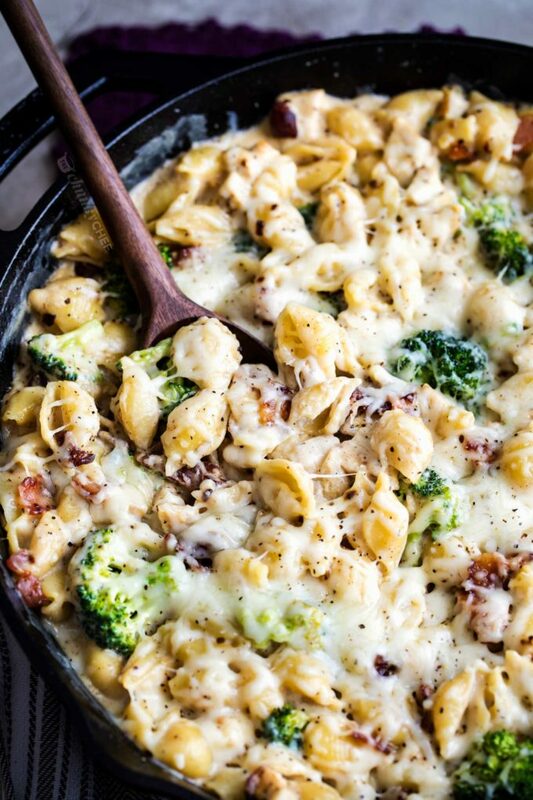 The pasta doesn’t actually cook in the same pot (which is what I consider a one pot meal), but in the food world there’s a general consensus that pasta doesn’t count, and if the rest of it is cooked in one pot, then it’s a one pot meal. So while I wouldn’t personally categorize it that way… you could if that’s your preference. DO YOU USE FRESH CHICKEN FOR THIS CHICKEN CASSEROLE? I’ve written the recipe for shredded chicken to be used, since I usually have some hanging out in my freezer from a leftover Homemade Rotisserie Style Chicken. BUT, below the recipe I’ve detailed how you can make this using fresh chicken breasts (still in the same skillet!). It’s a really versatile recipe! CAN THIS CHICKEN CASSEROLE BE MADE AHEAD OF TIME? Yes! 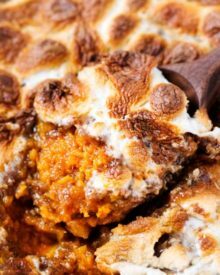 The whole casserole can be made up to the point of baking, covered tightly and refrigerated 1-2 days in advance. Make sure you set the skillet or baking dish out at room temperature for at least 30 minutes before baking. WHAT ABOUT FREEZING THIS CASSEROLE? I’ve never actually tried it… but I have with similar recipes, so I think it should be okay. Make the casserole up, but don’t bake it; then cover tightly and freeze for 1-2 months. Thaw overnight in the refrigerator and bake from the refrigerator (but add 10-15 minutes on the baking time). DOES THIS CHICKEN CASSEROLE USE ANY CANNED SOUPS? None whatsoever. I’m not entirely against using them, but when possible, I try to cook things more from scratch (we just like the taste better). Plus, since this recipe is mac and cheese-ish, there’s really no need for any condensed soups, since you’re making a glorious cheese sauce. 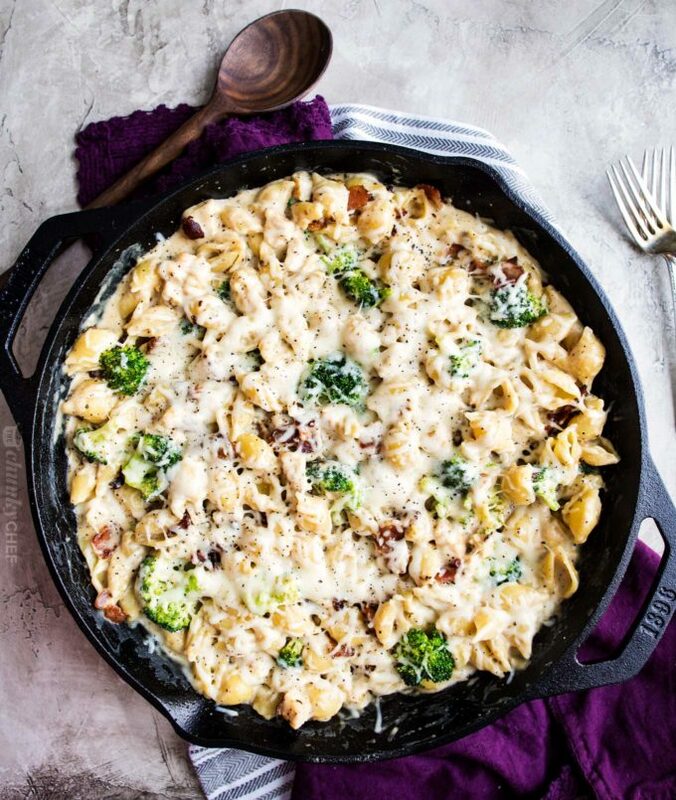 CAN YOU USE OTHER PASTA SHAPES FOR THIS CASSEROLE RECIPE? Definitely! I used shells since it’s what I had on hand, but any short-cut pasta works wonderfully. Elbows, rotini, penne, ziti, farfalle… you name it! 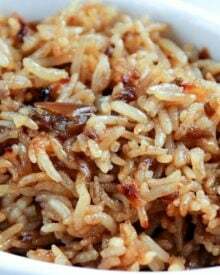 You could even swap in some cooked long-grain white rice if you wanted… but I’m not sure of the exact amount, as I haven’t personally tested it. Cast Iron Skillet – I use this skillet more than my regular cast iron, because the double handles make it so easy to carry! Box Grater – perfect for grating up cheese or veggies! Preheat oven to 350 F degrees. In a large, oven-safe skillet, cook bacon over MED heat until crisp. Remove to a plate, reserving grease in skillet. Remove all but 1 Tbsp of the bacon grease. To the same skillet, add diced onion and cook 4-5 minutes, until soft. Add garlic and cook 1 minute, stirring very often. Remove to plate with the bacon. Add broccoli to skillet and cook 2-3 minutes, until very bright green and heated through. Remove to plate. Add butter and melt, then add flour and whisk to combine. Slowly pour in milk and half and half, whisking until all flour mixture is incorporated. Cook, whisking very often, until mixture has thickened (about 5-10 minutes). 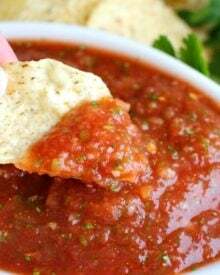 Remove from heat and stir in 1 3/4 cups of mozzarella cheese and the 1/2 cup of Parmesan cheese until melted. 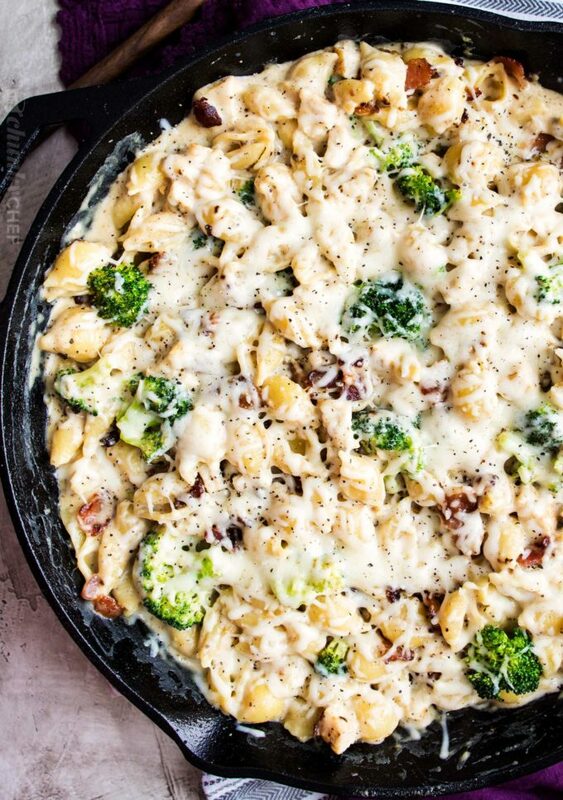 Add in cooked pasta, shredded chicken, bacon, onion, broccoli, salt and pepper. Stir until combined. 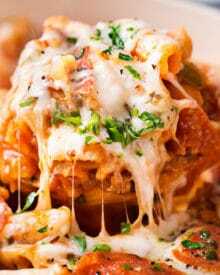 Top with remaining 3/4 cup of mozzarella cheese. Bake 15 minutes, then broil on HIGH for 1-2 minutes to brown cheese (optional). Serve hot and enjoy! After step 1, add 2 chicken breasts (seasoned liberally with salt and pepper) to the skillet and cook 5-7 minutes per side, or until cooked through. Remove to a cutting board and let rest 5 minutes while you work ahead in the recipe. Shred or dice chicken and add in step 6. Pre-cook bacon, onion, garlic and broccoli and refrigerate until dinner time. If using fresh chicken breasts, pre-cook and shred/dice, then refrigerate until dinner time. Heat gently in the microwave before using. Pre-boil pasta, drain and drizzle with a bit of olive oil. Cool completely, then store in an airtight container in the refrigerator until dinner time. Heat gently in the microwave before using. Pre-grate cheeses and refrigerate until dinnertime. Make casserole through step 6, then cool completely. Cover tightly and refrigerate 1-2 days. Let skillet sit at room temperature for 30 minutes before baking, then bake as directed. Hi, can i replace the flour with almond flour? I didn’t test the recipe with almond flour, so I can’t say for certain. 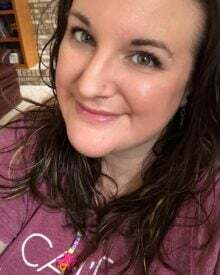 A keeper!!! I made this dish the first night I found it online. I had all of the ingredients and only tweaked cheeses based on what was in the frig with less mozzarella to minimize watery sauce outcomes, and easily converted to gluten free. Not a diet food, yet very tasty! Add to my din rotation. 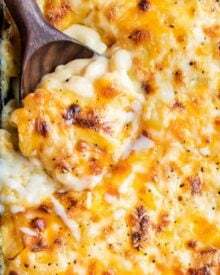 The cheeses in your Family Favorite Baked Mac and Cheese sound so good. 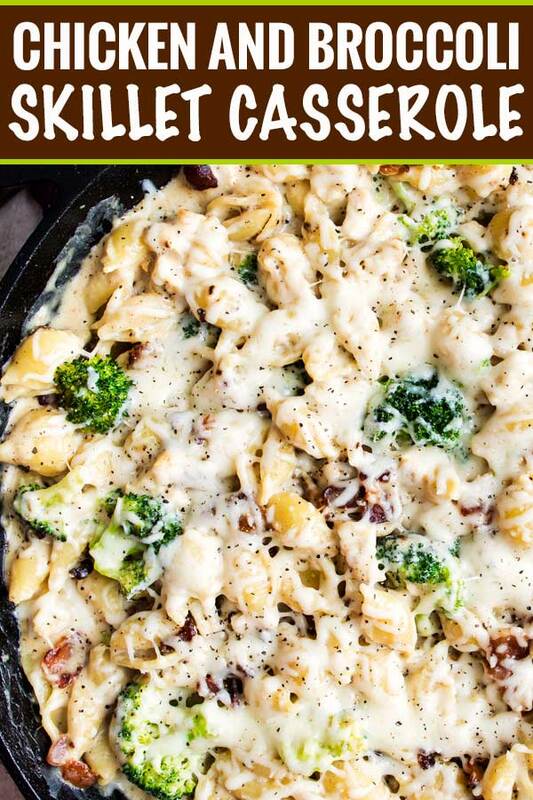 Could I use the sauce for that recipe in this one instead of the mozzarella and parmesan? Ohhh definitely, that would taste yummy! There is so much about this that I love! The cheese, the chicken, and how easy it is! What a great casserole! I have to make it on a busy weeknight! 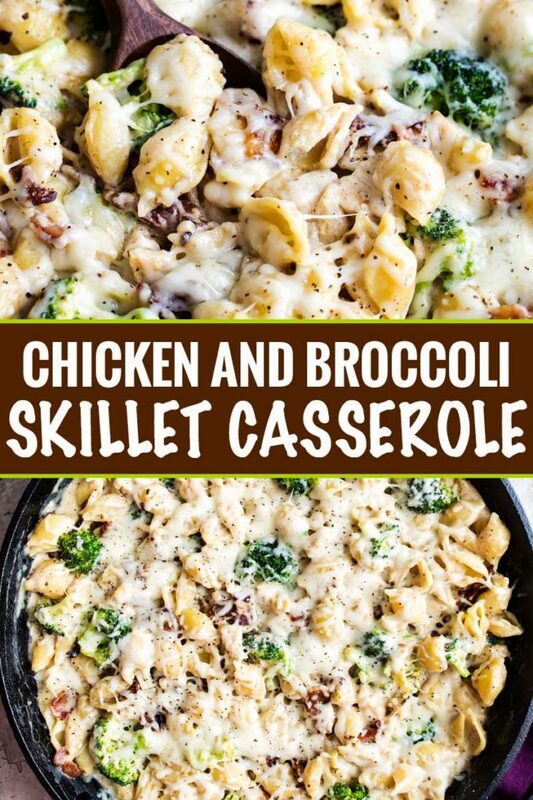 This casserole sounds like just the thing my kids would eat! Looks tasty! Lucky me I have everything I need to pull this together! Oh my! That looks so tender. I’m sure that the taste of this casserole is incredible! Thanks for the recipe! I want to try it! 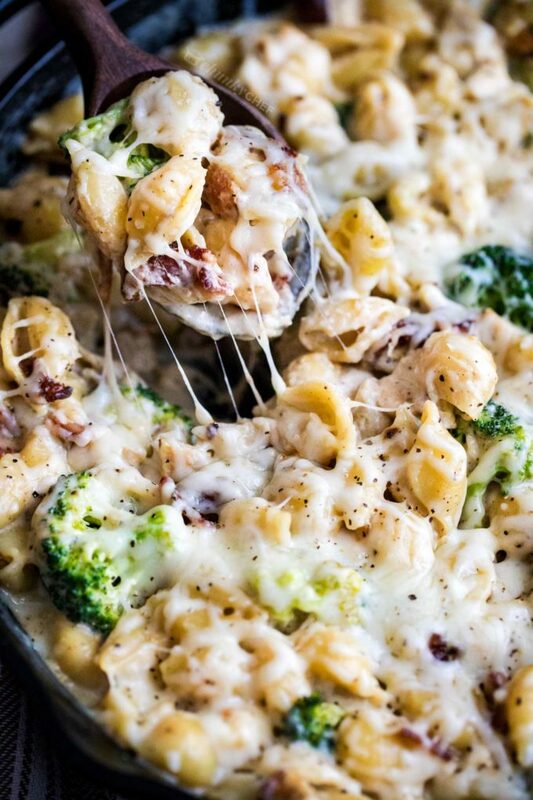 Pasta and cheese…. yes, every time!! This looks wonderful.